MARCHING.COM: Portland Rose Festival earns industry award for "best festival"
Portland Rose Festival earns industry award for "best festival"
PORTLAND, OR - The Portland Rose Festival's Centennial Celebration won the coveted Grand Pinnacle Award at the annual International Festivals & Events Association (IFEA) conference industry awards ceremony on September 19, 2007. The announcement was made in Atlanta, Georgia, the site of the conference. 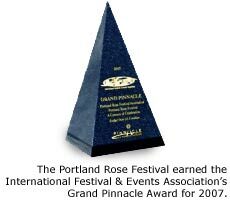 The Rose Festival took the most awards in its history, with 30 total accolades for separate events, programs and features. "The Portland Rose Festival has set many standards in our industry which have been emulated by others around the world," said Steve Wood Schmader, President and CEO of IFEA. "It's fitting for the Rose Festival to receive this honor after 100 amazing years." Festival leaders Jeff Curtis, Executive Director, Marilyn Clint, Associate Executive Director and 2007 board president, Leslie Goodlow-Baldwin were in Atlanta to receive the awards: nine gold, 11 silver and 9 bronze, along with the Grand Pinnacle award for the best festival in the world with a budget of more than 1.5 million dollars. The Kentucky Derby Festival in Louisville, Kentucky took the next highest honor. Once again the Rose Festival was strong in its community programs. For the tenth straight year the festival was named the top environmental event in the world, this year for its program entitled "A Century of Sustainability." The festival also had the top educational program and the top community outreach program, as well as the best children's programming in the world. Two of the new events produced for the Centennial celebration, the Centennial Ball and the Centennial Exposition, were both recognized in the Best New Event category. "It was a thrill to be in Atlanta and hear the Rose Festival announced as the top event in the world," said Clint, the architect of the festival's Centennial Celebration. "This award goes to the entire community  all the Rose Festival volunteers, sponsors and supporters." The IFEA is an industry association comprising 2,700 festivals, events, and professionals from around the world. The prestigious Pinnacle Awards recognize outstanding examples of special event promotions, community service programs, and marketing collateral within the international events industry. The Rose Festival is annually judged against peers in the festival and events industry, like the Pasadena Tournament of Roses, the Kentucky Derby Festival, the Macy's Thanksgiving Day Parade and Disney World. View more information about the Portland Rose Festival. Text and images courtesy of the Portland Rose Festival.